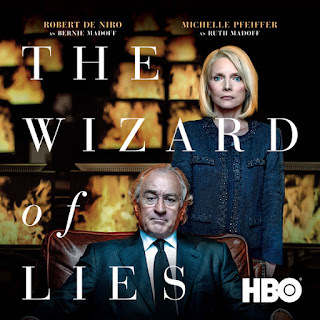 HBO's hit television drama "Wizard of Lies," starring Oscar winner Robert De Niro and Oscar nominee Michelle Pfeiffer available now on Digital Download. "Wizard of Lies is up for a few Emmy nominations such as Best Movie, Best Actor, Best Actress and Best Casting." Thisfunktional will be giving away some digital copies of "Wizard of Lies." I will let the winners be surprised when they receive their prize. 1 Digital copy of "The Wizard of Lies"
Disclaimer: Multiple winners will be chosen. Contest runs to Aug 04, 2017 midnight. No purchase necessary. Prize provided by 42 West. Only open to the U.S., no PO Boxes or international addresses. Only one entry per household. Entries on behalf of another person will not be accepted and joint submissions are not allowed. We will not accept entries of contestants who have claimed a prize in the last 6 months. In 2008, stockbroker, investment adviser and financier Bernie Madoff made headlines around the world when he was arrested for perpetrating the largest Ponzi scheme in U.S. history. HBO Films’ "The Wizard of Lies" chronicles the events that led up toMadoff’s admissionand the devastating aftermath. Watch Robert De Niro give “one of this best screen performances” (The New York Times) when "The Wizard of Lies" is available for Digital Download July 10 and on Blu-ray™and DVD October 3. Starring two-time Oscar®-winner Robert De Niro as Bernie Madoff and three-time Oscar® nominee Michelle Pfeiffer as his wife Ruth, this HBO Films drama dissects the events that led to the Wall Street financier's stunning downfall in December 2008 for defrauding investors of over $65 billion in the most infamous Ponzi scheme in U.S. history. Directed by Oscar®-winner Barry Levinson, "The Wizard of Lies" vividly recounts Madoff's audacious deceptions that culminated in his vilificationwhile catapulting his wifeand two sons into a harsh and unrelenting spotlight, with tragic consequences. The ensemble cast includes Alessandro Nivola,Nathan Darrow, Kristen Connolly, Lily Rabe, Hank Azaria andmore.Executive produced by Oscar®-winner Barry Levinson, Emmy®-winner Tom Fontana, Robert De Niro, Jane Rosenthal, and Berry Welsh.